How will Malaysian universities fare with massive budget cuts? the grandeur at Malaysian universities? One of the key sectors in government to face budget cuts last October was higher education. Hidden under the populist measures of BR1M payments, higher pensions, and a widening of zero rated items under the GST, cuts to higher education are just starting to make their mark felt now. Higher education institutions had their budget slashed by RM2.4 billion, from RM15.78 billion in 2015 to RM13.37 billion for the year 2016. These cuts have not been uniform. Universiti Malaya had the most severe cut of 27.30%, Universiti Malaysia Terengganu at 23.76%, Universiti Teknologi Mara at 23.72%, Universiti Pendidikan Sultan Idris at 20.78%, Universiti Utara Malaysia at 19.31%, Universiti Sains Islam Malaysia at 18.0%, Univsersiti Malaysia Kelantan at 17.62%, followed by Universiti Sains Malaysia at 17.14%, Universiti Teknologi Malaysia at 16.53%, Universiti Pertahanan Nasional at 16.29%, Universiti Sultan Zainal Abidin at 13.42%, and Univsersiti Malaysia Pahang at 11.18%. Universiti Putra Malaysia budget was cut 11.41%, Universiti Teknikal Malaysia Melaka at 10.78%, Universiti Islam Antarabangsa Malaysia 8.11%, with Universiti Malaysia Perlis, Univsersiti Tun Hussein Onn, and Universiti Malaysia Sarawak fairing much better at 3.64%, 3.71%, and 1.05% cuts respectively. One university, Universiti Kebabgsaan Malaysia actually got a rise in their budget with a 5.05% increase. One of the immediate problems with these budget cuts is their degree over such a short time. This gives some of the universities that received cuts above 10% very little time and latitude to adjust their spending patterns. This could lead to crises in some areas of the education system like the teaching hospitals. The well renowned University Malaysia Medical Centre (UMMC) which has been providing medical treatment to people who can’t afford private insurance, will according to Universiti Malaysa’s Dean of Medicine Professor Adeeba Kamarulzaman will be forced to cut back on both medical services and teaching. The present crop of Vice Chancellors has been used to managing their respective universities from guaranteed budget allocations, where it hasn’t been necessary to be too prudent with spending. They also have little experience in attracting other sources of revenue, other than their university budget allocations. 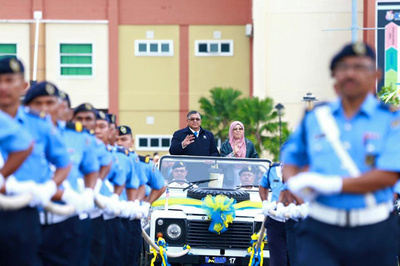 However the Ministry of Education is slowly retiring the ‘old breed’ of vice chancellor like Professor Kamarudin Hussin of Universiti Malaysia Perlis. 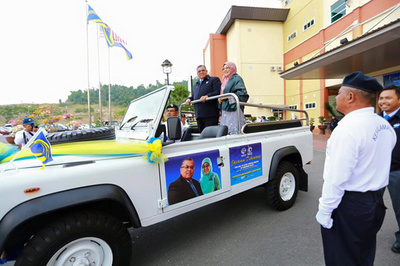 Kamarudin made an attempt to stay on to his post as vice chancellor, using the alumni students to make an appeal to the minister of Higher Education Idris Jusoh. 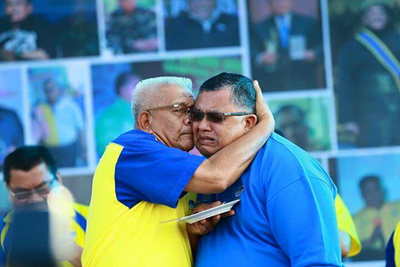 On the minister’s insistence that he must leave and take up a face saving position as a special ministerial advisor, Kamarudin made a grand exit from the University last week, as evidenced by the pictures. This grand departure came at the same time the besieged Prime Minister Najib Razak called on all government departments and institutions to spend less on events and protocols. Since his departure from University Malaysia Perlis, there is a lot of talk along the corridors about corruption that has been going on around the university by employees and academics. The incoming vice chancellor, who hasn’t been selected yet, due to the apparently sudden decision to remove the old vice chancellor will have his or her job cut out to eradicate the excessive waste and corruption that is being alleged by past and current staff. It is worth noting that the letter of appreciation for 14 years of service as vice chancellor was unusually not signed by the minister, but rather the director General of the Ministry, Professor Asma Ismail. The end of “glorious management” for UNIMAP? Does Kamarudin’s removal end grandeur at Malaysian universities? However the ministry is now beginning to place astute people like Professor Hassan Said as Vice Chancellor of Universiti Teknologi MARA (UiTM), who has experience running private universities as Vice Chancellor of Taylors University, which could be signalling a change in attitude to the way universities will be run. Malaysian public universities need to change the way they operate to cope with the budget cutbacks. Fortunately there are areas of excess expenditure that can be cutback without affecting teaching standards. However where some of the cuts have been drastic in institutions like Universiti Malaysia, Universiti Malaysia Terengganu, Universiti Teknologi Mara, Universiti Pendidikan Sultan Idris, Universiti Utara Malaysia, Universiti Sains Islam Malaysia, Univsersiti Malaysia Kelantan, Universiti Sains Malaysia, Universiti Teknologi Malaysia, and Universiti Pertahanan Nasional, new paradigms of operation need to be found and developed very quickly, if standards are not going to suffer. However one barrier to developing new ways to operate is through the fact that universities themselves are not autonomous bodies. What courses universities offer, fees they charge, who they enrol, who they employ, and generally how a university operates is governed directly through the Ministry of Education. To a great extent, universities are limited in what they can do in Malaysia. The issue of autonomy and budget cuts is something that is yet to be addressed by the Government. This has left some universities with very limited options. Some universities are letting go of foreign lecturers, cutting down on faculty operational costs such as stationary and air conditioning, and travel, etc. These measures will not make up the budget shortfalls universities are facing and could seriously hamper the ability of Malaysian public universities to improve standards. This is hardly changing the paradigms of university operation, and most probably affecting staff and student morale, and will hinder university development along the lines of the “Soaring Upwards” higher education blueprint the Government released in fanfare last year. In the words of Malaysian Education Minister Datuk Seri Idris Jusoh, the budget cuts will “train local universities to be more efficient in the implementation of their programs”. There is precedent for this in the Australian experience back in the 1980s where are similar magnitude of cuts were made to Australian universities. Australian universities turned to research collaboration with industry, running more management programs for industry, and drastically increasing the number of foreign student enrolments. Even university chairs became university sponsored which Universiti Malaysia Kelantan has done with the Maybank Professorial Chair of Entrepreneurship, within their Entrepreneurship Faculty, a great example for other universities to follow. More public benefactors are needed to help fill the gap, but universities need to work on developing ‘business models’ that are attractive to potential donators. There is plenty of scope for Malaysian universities to collaborate with industry on research, and management training and education is a massive growth industry within Malaysia that most universities have missed to date. There is plenty of room to aggressively recruit more foreign students who are willing to pay higher university fees if the market is tackled correctly, and Malaysian public universities become more ‘student friendly’. One of the other outstanding issues that require resolution is that of student loans. One of the major effects of budget cutbacks has been the incidence of loans to students, where Malaysiakini reported students quitting university as loan payments are not forthcoming. According to Malaysiakini MARA loans are reclining while Public Service or PTPTN loans which don’t cover living expenses are being offered. This is affecting access to higher education by the poor and needy students of the country, another issue that must be urgently addressed. As of late Malaysian students have been very vocal about whom they want to be Vice Chancellor of a particular university, it’s now time for them to be vocal about what type of education system they want for their country.